Teenagers love Snapchat and Instagram, and as we well know, teenagers don't do social media by halves. Many of them discuss, broadcast and investigate every little detail of their lives online, and according to a recent investigation by the producers of an upcoming BBC Three program, that includes buying and selling drugs. The makers of the program spoke to dealers as young as 15, who claimed that online sales had become the majority income source for a lot of groups, and that an individual dealer could earn £300 or more in a single day. Of course, Snapchat and Instagram both have a strict reporting system to prevent illegal activity on their platforms, but reporting only works when there's something recognisable to report, and in this case the dealers have found a way to ply there trade very discreetly. The kids selling the drugs use a complex system of emojis to communicate to those in the know what they're offering, and once the upfront sale gives way to private messaging, there's no way to monitor it without an actual warrant. Even if a report goes through, it can take days for the report to be processed and evaluated, and even then the platforms may not find sufficient evidence to take things any further. This kind of dealing usually comes out of large scale operations which ship in huge amounts of drugs to be sold on a weekly basis. When an outfit that size says that 75% of their profit is coming from kids selling on Snapchat, it's worth taking seriously. There's low level drug dealing and then there's full scale drug trafficking. Based on the evidence the BBC have gathered, this looks very much like it's the latter. When reached for comment, Snapchat and Instagram gave more less the exact same answer: if you see something sketchy, report it. The dating app Yellow, who have also been under scrutiny for increased drug activity, admitted that they could be doing more to deal with it, but on some level it's beyond them. Could these platforms be doing more to directly combat the sale of illegal drugs? Possibly, but it's an issue in society, not social media. 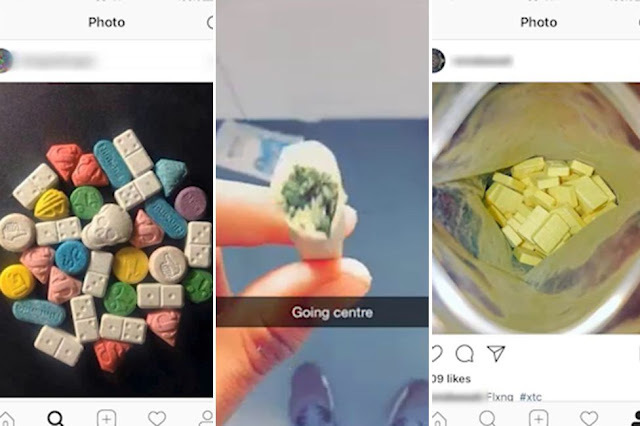 The fact that Snapchat and Instagram have become popular platforms for young drug dealers is an unfortunate side-effect of a societal structure which allows teenagers to be brought into a dangerous, criminal underworld.